Are We Reaching Out to the Scattered? I really love today’s Gospel, because I often reflect upon being one of those sheep who went astray and the Lord in His Great Love (with better things to do and better people to save) chose to come and get me. I also know He did so through some really great people! While I think about this often (as you probably notice if you’ve read a few of my reflections) I also know I’ve got a long way to go in being one of those people who is a true Instrument of the Lord in bringing others back. It’s hard to let go of the security we have and find in our faith. As a priest, I am called upon by the Lord to emulate Him as Shepherd. It is my role and duty to leave the 99 and go find the one and yet it’s very easy to preach to the choir. We priests can find ourselves so busy that we stay in our churches, among the gathered and don’t find the time to reach out to the scattered. This is where we are not doing our jobs unless we empower others to take care of the gathered, as they themselves are gathered and then empower even more to come and help us reach the scattered. I think of my first parish assignment, at St. Patrick’s in Markham. I remember being told by some of my mentors and priest friends that I should not spend an inordinate amount of time in the schools, that what I had a passion for as a seminarian was not my job as a priest. I took it to heart that too much time in the schools might be self-serving and that I should consider my place in celebrating the Sacraments inside the parish. I took this to prayer and really felt that the Lord showed me it was not selfish or self-serving and I don’t recall a time I neglected to show up for the parish sacraments, and I did more in our feeder schools than I did as a seminarian. I don’t share this to make a point about me, but rather to say that we need to rely on the Lord in this way. For the many (many) things the Lord needs to continue to reveal to me, one thing He has already shown me is the importance of going out in search of the “scattered”. I spent a lot of time in the schools as a parish priest, and I know as many of us do that there are a large number of students, just as their parents have stopped coming to Church – have very limited ways of knowing the love and mercy of God and I saw in the questions of these kids a thirst for something that was not mine to decide to give or not give. The Word of God, the Good News of Jesus Christ is not meant for who we decide it should be for – only the worthy. It is for all. I am a recipient of that, when I was far-scattered, I am truly thankful the Lord came to me! Do We Set Limits Upon the Lord? Can we be narrow-minded when it comes to the Lord’s saving work in our lives and the lives of others? Can we place limits on what God can do? Can we miss the “big picture” of what God is trying to accomplish because of what we think should be accomplished? Why should we (and do we) have faith in God and trust Him? I learned what it means to live for something much greater than myself. Jesus has forgiven me of my sins, He continues to forgive me of my sins and has extended to me Infinite Love and Infinite Mercy – and has asked me to do the same as a follower. In and through my vocation, He has also called me to extend this very miracle of forgiving sins. And if that’s not enough (and it truly is) He has also given me (us) our life back. What Does the Immaculate Conception Have to do With Us? Mary, the Mother of Jesus (of God) who we affectionately and personally call “Our Lady” was born fully and completely human and by the Grace of God had the stain of Original Sin, which affects us all – taken away from her. Why do we accept and believe this? Why is this important? And what does it have to do with us? We accept and believe that Mary was conceived immaculately because her life was given in service to the Lord, from the time she was born, through her childhood, adolescence, young adult and until her dying day, she served God with every virtue given (faith, hope and charity) and every virtue she worked at day by day. This is important because it brings together the freedom every one of us have been given (to choose to do God’s will or not) and Divine Providence (that Almighty God Himself knows every action and the outcome of a life). In knowing this, Mary is given (and we are given too) special gifts, in her case because her vocation is best suited by it, she is conceived immaculately. Mary was fully capable of sinning and we sometimes forget this – but in choosing not to, she responded daily to God. She responded with an openness and obedience; a faith deepened constantly by trust. Mary in the truest sense, lived and breathed her vocation. Mary lived out from beginning to end her life’s purpose! She is a model Christian, and we can learn a lot from her. We may not have been conceived immaculately, but then we need to remember that our vocation is no less important to the Lord, or to Our Lady. We, like her were given gifts from our conception, gifts that we can only know with prayerful self-reflection: not to use for selfish purposes but for self-less giving to God and to others. Divine Providence is in play in our lives as well; that is, God has a plan and a desire for each one of us and there is something universally and personally important for us to be doing in and with our lives: maybe to be a Priest of Jesus Christ and make present His Sacraments for us all, maybe to be a Religious or Consecrated Sister or Brother and dedicate our lives to service of God and His Church in ways of the utmost importance to salvation, maybe in the Generous Single Life in Christ giving ourselves totally and completely to Christ and His Church and maybe as a devoted Husband or Wife; Mother or Father married to God and to our spouse and building up the Church through the family we love and minister to; creating Holy Families throughout the world. Have You Been Healed by Jesus in a Personal Way? Have we (you) had a personal encounter with our Lord Jesus Christ? Has He healed you of your blindness? I have had one of those experiences and I was healed, but I continue to need healing from so many of the ways that I am blind. In today’s Gospel we hear of two blind men calling out in public for Jesus the Messiah (Son of David recognizes His predicted coming in the line of King David, as it is written) to have mercy on them. They are aware of the Messiah in their midst but we also hear that Jesus waits until they are inside the house to speak to them: placing a premium on the personal encounter and it is there and through that personal encounter they are healed. I’ve spent the majority of my life being hostile to religion and to religious people, most notably Christians because almost everyone I knew was Christian. I had no interest in anything religion was about until I came to a point of realization that I wasn’t living for anything real or significant in my life: the very accusation I made against religious people. I wasn’t an atheist, I did believe in a Creator God and it was to Him I prayed. I had a personal encounter with Jesus His Son, first through the Word and then a few years later through His Sacraments and through His Church. Over several years, the love I was coming to receive, know and accept from God was leading me to “see things” I was not and had not seen before. Little by little, I was less blinded by my opinions and judgments and more open to the grace and love of God in my life, and then as God desired it – I had sight to see the goodness of people. I think of the amazing “miracles” of healing that have taken place in my life. I think also of the work the Lord still has to do. When I read and reflect upon today’s Gospel, I also think of how I gained sight through my own personal encounter with Jesus. And I am blessed to spend my life (through the priesthood) thanking Him for it and asking Him to continue healing me of what I need healing from in order to live the best Christian life I can. I remember reading a book in seminary “Dare We Hope” by Hans Urs von Balthasar which gave us food for thought – who is saved and who is not? Although some people may think it’s a “cop out” for a Catholic priest to have little to say about this – I have little to say. The reason is that while I seek to abide in God’s infinite love (and try daily not to put limitations on my own love for others) and His infinite mercy gives me authority to preach on our need to forgive without limitations – I speak very little of God’s judgment. It’s not that I don’t believe or accept God’s judgment but I really do believe that this is the area that any thought, opinion or reflection I have on God’s judgment will be more what I think and less about what God’s judgment actually looks like. In a recent homily I gave to our seminarians, where I offered some thoughts on how to speak about hope when Jesus speaks to us about righteousness and judgment I put it this way: “The righteous (and unrighteous) will be judged by God but we have to remember first and always that God judged us worthy of giving us His Son, worthy of salvation, worthy of redemption and He makes a pretty good argument to leave the judging to Him and Him alone”. I may have my personal opinions and beliefs about someone’s bad actions landing them in hell as opposed to going to heaven – but that is 100% up to God and I don’t hope hell for anyone! If I did, that would stand directly against what I am called to live my life for as a Christian and as a priest: to get to heaven and to bring AS MANY people with me as I can. Dare we hope that all by the Grace of God will be saved! There are good theological reasons to see the miracle of the multiplication of the loaves and the Holy Eucharist in the same light. I often think of the multiplication and miracle of Jesus feeding these people in a pastoral way as well. I find myself moved by the love and compassion Jesus has for the people who come to Him. As a Catholic priest, by the power of God through Jesus and the Holy Spirit, I pray over bread and wine and it becomes the Body and Blood of Jesus, the Bread of Eternal Life. I am very mindful of how much I want all the people who come to receive to know Jesus in this way. I see so much faith and trust in their eyes when they come forward to receive Our Lord. I really and truly believe that when much of society and the media often can suggest that the Catholic Church is becoming irrelevant, it hasn’t been my experience. People still come for Holy Mass – NOT BECAUSE any of my brother priests or bishops or myself are amazing; but because Jesus is there! There are many miracles beyond what I am describing taking place in our faith communities all the time, but that the Lord Jesus makes Himself present in so many different ways, but to feed us with His own Body is really and truly a gift from God!!! Are We “All In” As Disciples? Where would professional sports be if a world-class athlete were not to give 100% to preparing for the big games or the Olympics because he or she was worried along the way that they might be traded to another team? For this reason they need to mentally prepare themselves for the task at hand trusting that whatever happens, they’ve given everything and it’s never in vane! This analogy may not be an exact fit for our Disciples today, but it might be worth our own consideration as Christians. We prepare and work as Christian Disciples for something we can’t see around us right now – Heaven and Eternal Life! Jesus says “blessed are the eyes that see what you see”. The Son of God entered the world and performed miracles and did many things before the eyes of the people. His Apostles & Disciples did many of these things as well. Everything they (and we) do is for God and the blessedness of eternal life with and for Him. Our lives are given to tasks that very much benefit this world but are meant for things far beyond. And when we see God, God’s actions in the world (people being drawn back to God, back to the sacraments, back to His Word), and we see God in others and acting in that person and through the Person of His Son – truly, blessed are our eyes to see that! Friends, we too need to mentally prepare ourselves as athletes do, but most importantly as Disciples of the Lord do, to go out and work tirelessly for the most blessed of all things: faith, redemption and salvation – and know that the Lord who empowers us to do this, blesses us as He did those in today’s Gospel. Are We Ready to Let Jesus Lift the Limits from Us to Grow in Faith? “Lord, I am not worthy to have You enter under my roof, but only say the word and my soul shall be healed”. As we profess these words with faith when the priest holds the Body of Christ before us – does it ever occur to us that these words are offered for us and memorialized in the liturgy by someone who would not have likely been considered to be a good Catholic Christian? These words are not of someone in the inner circle or who was likely with Jesus at many of the various key moments through Galilee or Jerusalem, unless it was to oversee the soldiers who were monitoring Jesus; and then the inner circle might have been treated these soldiers and the centurion with suspicion. In this part of Matthew’s Gospel, we also hear other accounts of people reaching out to the Messiah in unconventional ways. The Old Testament prophecy about the coming of the Messiah suggests that God would send His Messiah to redeem Israel, and surely many people had their own beliefs that this would benefit them and only them as they stayed on the “inside tract” of their faith. There were many who were ready to accept and believe that they were to be redeemed for what they had been doing to “keep on the right side of the Law”. But there were many who, for various reasons were on the outside looking in. We also know that there were many who were “on the right side of the Law” who were not able to open their hearts and minds to Jesus as the Messiah, doing exactly what He came to do –because what their own sense of righteous provided them was a limitation to who was to be saved and who among them was to be condemned. They were not willing to think “outside the box” and because of this, they projected their own limitation on our Lord and Saviour. Jesus knew no such limitation, and today’s Gospel is an example of this. He praises the faith of the centurion, and in healing his servant from afar gives us all yet another example of his unlimited scope and reach in bringing people back to God. I am in the process of reading and praying over “Gaudete et Exsultate” [Rejoice and Be Glad], Pope Francis’ exhortation to us on living our call to holiness. What impresses me the most about this exhortation from the pope is how he highlights the reality of holiness for us. Holiness in life isn’t meant to be for someone else – it’s meant to be for all of us. We are all called to be saints in this world AND I would suggest with all the complexities, problems and issues in the world we are living in – we need saints now more than ever. We aren’t called to look like saints from the past or be like one or another. We are meant to aspire for holiness in the life we are living now. Of course there are common characteristics among saints: an ever growing faith, a present and growing desire to be like Jesus Himself, a desire to work with God’s grace in tackling and overcoming sin in our own lives, deep commitment and desire to be merciful and understanding, a constant desire to love with the unconditional love that has been extended already to each of us, to forgive others in the complete and unconditional way we have been forgiven. Do you want to become a saint? I know that I do. We need to ask ourselves: “what is standing in the way of me becoming a saint of our Lord Jesus Christ”? The answer to this cannot be what we’ve done in the past – that’s not good enough! The answer is to be found in what are we willing to do today and for the rest of our lives? Are we willing to acknowledge the Power of God and live our lives rejoicing in what God can do with us if we are open to it? Are we ready to love as much as we can, forgive as much as we can? Extend mercy and kindness to everyone we can? Serve others today and every day of our lives? Then we are ready to become saints. Jesus has not placed limits on us, as the Gospel assures us today. We place limits on ourselves. Are we ready to allow our Lord to lift those limits from us today? 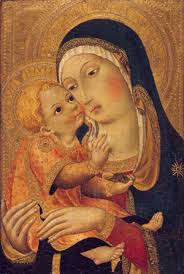 23rd Tuesday: Celebrating the Birth of Mary & Mothers: They Do So Much For Us. Reflecting upon today’s Gospel, it occurs to me as the genealogy of Jesus is proclaimed that one of the things which this points out for us is that everyone’s life has meaning and purpose. Little did Sts. Anne & Joachim know what was in store for their little girl when they gave birth to her, but aren’t we all glad that they did? Even though Mary didn’t sin in her lifetime, and was given a very special grace which she responded to day by day throughout her life, not always easily we can well imagine and remained pure, holy, without sin, totally and completely devoted to God and to His plan as He revealed it to her throughout her life – a plan which included dedicating her life to her Son (as mothers often do for their children). A plan which included the joys and triumphs of knowing her people would be saved by Him, but also that a sword of pain and suffering would pierce her heart too. Mary saw the meaning of her life, because I’ll bet there were days when it was hard to see why she was born when Jesus was attacked publicly. Knowing it was God’s plan, that it was all for a reason, a faith which was deep and pierced the same heart too I truly believe must have been one of Mary’s great gifts. I think today of my own mother, who was young (19) when I was born. I know in my adulthood she told me she felt unready and not mature enough to be a mother when I was born. She lived in a time, culture and society where very young motherhood was no longer the norm. But she did the best she could, she was a dedicated mother for my sister and I and I think of the great blessing I’ve received (but others too) of her life. She is gone now, but her memory and all she has done to make a good life for me lives on. I know that my own mother’s life had so much meaning and purpose, so much of that was evident in the people’s whose hearts she touched and the difference she made in the world. But part of that meaning and purpose, she passed on by giving birth to my sister and I – and I thank God today that she did. I think for each of us, no matter who we are, we ought to give thanks to our moms (with our dads of course) for bringing us into the world, as our Lord Jesus rejoices on this feast day the Birth of His Mother Mary! I’m Spiritual, but not Religious!! Weekday Homily by Fr. Chris Lemieux [St. Michael’s Cathedral] for Thursday February 13, 2014: Today’s Gospel is for all of us a great sign of hope. How so we might ask? It appears in the dialogue between Jesus and the Syrophoenician woman that the Lord’s will is that only the Chosen People of Israel receive the grace, blessing, and healing from God. But this woman of faith does not give up and she appeals to the Lord. Her prayers are answered. Sometimes it’s hard to accept and believe that our prayers are necessary at all, the God of the universe who knows so intimately each and every heart wouldn’t He simply know our needs and desires, and wouldn’t He simply want to grant them? Wouldn’t He simply know the faith and devotion we all have – and simply answer our prayers accordingly? Today there are many people who say “I’m spiritual, but I’m not religious”. Often that can mean very different things. It can mean that one hasn’t been born into a family or raised in a particular faith tradition but that they are open to the grace of God, that they are open to knowing and loving and being closely connected to God. But it can also mean, depending upon who makes this comment that they have been born into a faith tradition and have chosen not to be part of that, because they don’t want to have to follow the rules of morality, or pray intentionally, or believe in things that are discomforting, or love unconditionally, or seek ongoing conversion and ask forgiveness for sins – such as is our faith tradition. Obviously there are degrees of both, and it’s not simply black and white, one or the other but when people say I’m spiritual and not religious and they are motivated in this second way, they are closed off and not open to the gift and grace of God. In today’s Gospel, Jesus provides a challenge to this woman, but to anyone who would say “I’m spiritual, not religious”. To the one who is open and not there yet, they are challenged to deepen their faith, to begin to trust, to be hopeful. To the one who is closed, Jesus know they will walk away, and although that breaks His heart, love and the grace and gift of God must be chosen. While it’s free and most desirable, it can’t be forced, and it can be refused. Today’s Gospel is a sign of hope. No matter who we are, no matter what we think we deserve or don’t deserve; if we have faith, the Lord will receive us. He will challenge us, because it is most important that our intentions for faith and relationship be pure or be purified but if we have faith we will be received no matter what. My brothers and sisters in Christ, let us all be open, and more open to what the Lord is offering. Let us give ourselves more generously in our faith and be assured that while we will always be challenged in that faith, the Lord does desire us close to Him. May God bless you.